I did the diagnostics scan to get the recommended channels, but now can't figure out how to actually change the one I'm on. I tried entering my IP address (10.0.0.5) into an internet browser like the guides I'm finding online say to, but I just get a "This Page Isn't Working" message. This on a MacBook Pro using Comcast, if that matters. Last edited by CyborgGT; 06-26-2017 at 04:07 AM. Assuming your wifi is the comcast modem/router you would enter in your default gateway to get to the config page of the modem. From there, login, change wifi settings. ifconfig in a command prompt/console should get you the default gateway. Also I recommend a wifi app on your phone to tell you who has what channel ID around you so you can isolate yours from the rest. ... uh, what? Gateway? Modem pages? Computers aren't my thing at all, so I'm not exactly sure what you're saying, lol. Last edited by CyborgGT; 06-26-2017 at 06:28 AM. Ya, i'm not clicking on that, looks too spamy. But let me help ya. The Telco modem is the unit they came and installed when you got internet. It's probably an Motorola, Arris-Surfboard, Actiontek, LanTronics, etc. It's also the thing you plug into to get internet. It may look like . Wi-Fi: Click Advanced in the bottom right-hand corner of the window, and then select the TCP/IP tab. You'll find the default gateway address listed next to Router. Ethernet: You'll find your modem's default gateway address next to Router as shown below. Once you have the default gateway address (it will probably be a 10.x.x.x or 172.x.x.x or 192.168.x.x) you enter it in to the browser. So if you don't know what a default gateway is, why you trying to change channels? Whats the problem you're trying to fix? 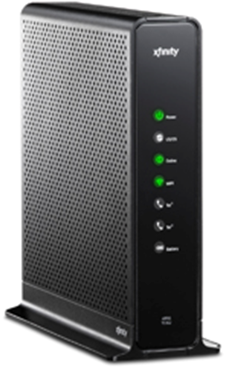 Are you using the Comcast device that is both modem and router in one? If so, those things are notorious for being wonky. I have a few friends at Comcast, and every one of them has said they're awful. I use mine as a modem only, and run through a half-decent Netgear router that I picked up. I've always managed to force my devices to work (when the devices themselves weren't utter shite), but unfortunately I rarely actually knew what I was doing. I just utilized the Comcast help page/forum a LOT! Accordwgnguy, it's to solve slow internet speeds. I did a search on how to speed it up, since Kaspersky is telling me my laptop is clean, and that was one of the better sounding tips. I did the diagnostics scan to see how many other local users were on the same channel, and a lot of us are on the same one. It gave me a couple channel recommendations, so I'm wanting to switch to one of those to see if it helps. Raf, that link I posted gave me the same walkthrough you did. I entered the default gateway into a web browser and the Xfinity site came up once but I tried to reload because it was acting like it wasn't wanting to load after I entered the user/pw, and now I can't get the login screen to appear at all. It's "loading" but staying blank. And I knew what the modem itself is; it was the "pages" part that threw me off. Last edited by CyborgGT; 06-26-2017 at 05:40 PM. Deev, it's the two-in-one. Same unit Raf posted, actually. I'll have a poke around the Comcast forums to see what people are doing about that.